Grower of over 1500 varieties of tall bearded iris provides history, map and directions, and information about the plants. Victorian show garden in the foothills of the Sierra Nevada, landscaped with iris, daffodils, wildflowers, shrubs and trees, and surrounded by an iris nursery. Commercial iris garden offering a range of iris varieties. Family-run iris nursery with display garden in Denver, Colorado. Online catalog, showcase of new introductions, and growing tips. Commercial iris garden offering a wide variety of tall bearded iris grown in Californias fertile Central Valley. Iris nursery in California, providing mostly tall bearded varieties. Online product listing and order form. Also summary information about the Victorian show garden on the nursery premises. California grower and retailer of tall bearded iris. Commercial iris garden located in Porterville offering online shopping. Professional wildlife and pet portrait artist Iris McCubbins creates beautiful custom art for the home and garden. Specializes in tall bearded iris, offering over a thousand varieties. Price list in PDF format. Also provides information on a pictorial reference book on tall bearded types, and on the Middle Tennessee Iris Society. Iris nursery and garden in Texas, offering over a thousand varieties of miniature to tall bearded irises. Catalog, new introduction showcase, information about events. Family-run commercial garden in California specializing in tall bearded irises. Catalog, recent introductions, information about care and culture, and about visiting the garden. Retailer with gardens open to the public. Garden photos. Sells Pacific Coast, Siberian, Japanese, Spuria, Species, and Tall Bearded Iris. Online ordering and visiting hours. Hybridizer and grower of numerous iris types. Includes an illustrated online catalog, information on iris terminology, cultivation, and diseases, as well as open house events. Specialist Louisiana iris nursery in Sydney, Australia. Online illustrated catalog, new introductions, and world-wide ordering information. Also offers a few other iris varieties, calla lilies, and daylilies. Hybridizer and grower of iris in Ontario, offers bearded, species, aril-bred, and Siberian varieties. Illustrated online catalog, and information on iris terminology, cultivation, and diseases, as well as open house events. Offers home and garden products, apparel, accessories, collectibles and gifts. Sells tall bearded, arilbreds, PCIs, spurias, Siberians and Louisianas. Offers tall bearded iris grown in southern Colorado. Virginia-based nursery selling daylillies and peonies, as well as bearded, Siberian and Japanese iris. Sells Pacific Coast, Siberian, Japanese, Spuria, Species, and Tall Bearded Iris. Nashville, Tennessee nursery specializing in antique bearded iris and species crosses. Hybridizer Vincent Christopherson showcases his introductions, arranged by year and alphabetically. Instructions for ordering by mail. Over 1500 cultivars of tall bearded, arilbreds, PCIs, spurias, Siberians and Louisianas. Gardens open to public in April and May, other times by appointment. California source for aril, dwarf, historic, median, reblooming, spuria, and tall bearded irises. Ordering information, text catalog. Kentucky grower and hybridizer specializing in reblooming irises. New introductions are featured and priced online, with instructions for obtaining a full listing by mail. A commercial iris garden of almost 2,000 cultivars in Washington state, offering several hundred bearded varieties by mail order. Online catalog with small photos. Oregon based grower of bearded iris and hybrid daylilies. Specialty nursery in Texas, offering hybrid bearded iris for direct sale as well as for online purchase. Illustrated catalog, photo album, and information about their spring garden tour. Hybridizer Lowell Baumunk offers his own introductions as well as a large general assortment of bearded iris species and hybrids. Showcase of introductions, catalog, and printable order form. If the business hours of Leotas Iris Garden in may vary on holidays like Valentine’s Day, Washington’s Birthday, St. Patrick’s Day, Easter, Easter eve and Mother’s day. We display standard opening hours and price ranges in our profile site. 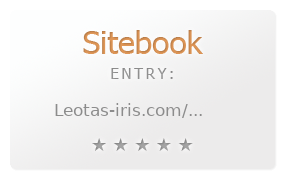 We recommend to check out leotas-iris.com/ for further information. You can also search for Alternatives for leotas-iris.com/ on our Review Site Sitebook.org All trademarks are the property of their respective owners. If we should delete this entry, please send us a short E-Mail.